Note:The treadmill motor for the DC motor, running more smoothly, each time using a treadmill for 45 minutes or 1 hour, need to rest for 15 minutes, so that the motor cooling. Silicone oil once a month, each time add one third, and both sides should be added. This silicone oil is environmentally friendly materials, no pollution. Add silicone oil to lubricate the treadmill. Folding Soft Drop System:Easy to fold up with two pneumatic shocks to assist when raising and lowering the run board.Unfolding run board lowers slowly, hassle-free and safely every time. Rolling wheels, move for easy. 【 FREE INSTALLATION & Adjustable Incline Design】 : Free installation! Has been assembled and folded, just need to put the screws on.Simple and compact space saving design that folds down for storage and contains rolling wheels on the bottom providing simple transport. 3 levels incline change design help you burn more calories, tone more muscle, and build greater endurance. 【Big & Multi-Function LCD Display】Keep track of gains and losses with easy to read backlit multi-display console,Displays :heart rate, speed, calorie,time, distance, mode, keep track of your performance and monitor your progress. Built in MP3 connectivity and hi-fi stereo system allow you to enjoy music as you run. 【0.8-14.8 KM/H Speed levels & P01-P12 Programs 】With 0.8-14.8 KM/H Speed levels available, you can select different speed base on your physical condition and exercise based. This treadmill reaches a max speed of 14.8 KM/H.There are also 12 programs available for you to choose, these easy-to-use exercise programs help to improve your cardiovascular fitness, boost your health, and burn fat. 【Safety Design and Cushioning Design】Safety Key connect you and the machine, emergency stop button on the handrail, which double protect you while working out. 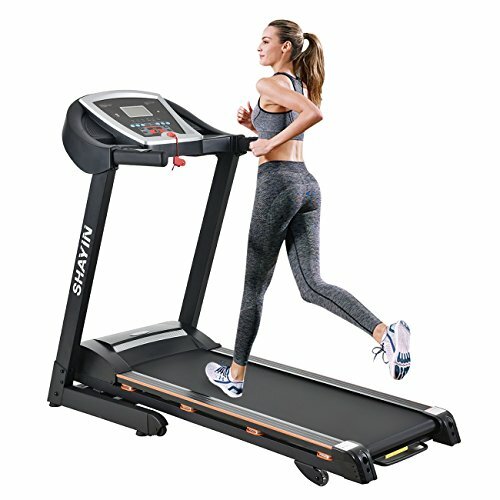 Cushioning design on both side of treadmill will reduce noise and descrese vibration to your floor, provide you best and quite workout experience. If you have any questions about this product by Shayin, contact us by completing and submitting the form below. If you are looking for a specif part number, please include it with your message.